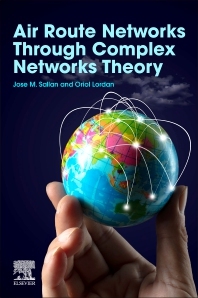 Air Route Networks through Complex Networks Theory connects theory research with network connectivity analysis, providing practitioners with the tools they need to develop more efficient, resilient and profitable air route networks. The book helps airline route planners and executives create more robust route networks that are less vulnerable to disruptions, such as node isolation. The book further explores errors and attacks in complex networks, strategies for detecting critical nodes and cascading failure models to assess and maximize robustness. The book explains how to measure air route network connectivity with complex network representations. Air transport is among the most dynamic and toughest competition industries in today’s global economy. The quality of air route network design is a key strategic factor in an airline’s viability. These robust networks provide for more stable and secure carrier operations vs. those based simply on existing supply and demand volumes. Node-specific and network-specific representations are covered, along with in-depth coverage of connectivity in special and temporal networks. These collective tools serve as a guide for practitioners seeking to apply complex network theory to the airline industry. Jose M. Sallan is an industrial engineer, and received his PhD from UPC. His primary research interests are the analysis of air route networks through complex networks theory, and the application of social sciences research methods to the fields of marketing and human resource management. He has published numerous journal articles, including several in Elsevier journals, Journal of Air Transport Management, Journal of Transport Geography, and Transportation Research Part E: Logistics and Transportation Review. Oriol Lordan is an aerospace engineer, and received his PhD from UPC. His primary research interest is the analysis of air route networks through complex networks theory. He is also interested in the application of operational research to model the different stages of airline and airport operations. He has published numerous journal articles, including several in Elsevier journals, Journal of Air Transport Management, Journal of Transport Geography, and Transportation Research Part E: Logistics and Transportation Review.